I don't know what it's like in other schools around the world but where I'm from we are tested and trained as individuals. I understand this is how it needs to be done but I remember going through school thinking that I would have to be dealing with all these calls by myself. The reality is quite different. My partner and I always work as a team and we are both attending the calls. When we need back up it is always there, I know we're lucky in our service to have this as I've worked in some places that backup wasn't ever available. This image shows the teamwork that is involved in most serious calls in my area. 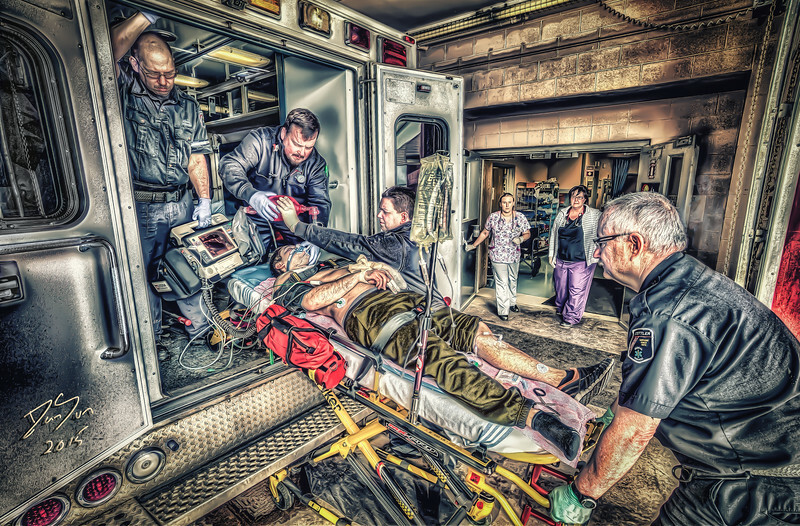 Thank you Stettler EMS for staging this image for me. Often once we get our patients into the trauma room we'll stay and help the ER staff with resuscitation efforts. There's alot of people involved in patient care, right from the dispatcher to rehabilitation therapists. Sometimes we only think of our part but we're just a piece of the big puzzle.